The brain and spine are vital to keep the body alive and functioning. Everything we do depends on the messages (nerve impulses) that are sent from the brain, along the spinal cord and on to the rest of the body. The brain is a complex organ that is enclosed inside the skull. It controls everything that happens in the body, including vital functions like breathing and heartbeat. Without the brain, the body would not be able to function. The brain is very delicate and is well protected by the skull. It is surrounded by a fluid called cerebrospinal fluid (CSF). The main functions of CSF are to protect the brain (it acts as a shock absorber), to carry nutrients to the brain and remove waste from it. 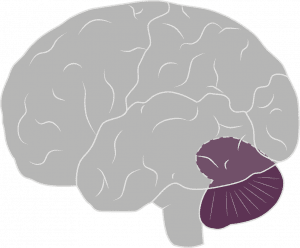 The frontal lobe governs our personality, character and behaviour. It is where we control our body movement and how we express ourselves. This part of the brain allows us to speak. It is also where we solve problems and do most of our learning. It allows us to organise and plan. 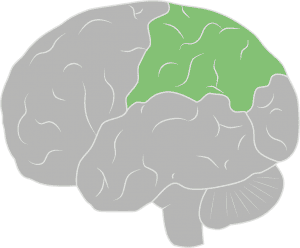 The occipital lobe receives messages from the eyes and recognises shapes, colours and objects. This bit of the brain allows you to tell the difference between a square and a triangle. It also controls your eye movements. 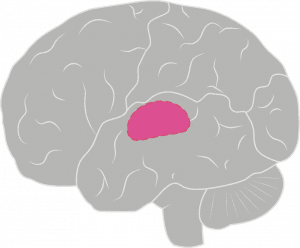 The parietal lobe gives you a sense of 'me'. It figures out the messages you receive from the five senses of sight, touch, smell, hearing and taste. This part of the brain tells you what is part of the body and what is part of the outside world. You have two temporal lobes, one behind each ear. They receive messages from the ears so that you can recognise sound and messages. This part of the brain also recognises speech and is how you understand what someone says to you. It also helps your sense of smell. Your short term memory is also kept here. The cerebellum sits at the back of the brain and controls your sense of balance. This allows you to stand up, walk in a straight line, and know if you are standing up or sitting down. The brain stem controls your lungs and heart and blood pressure. It sits at the top of the spine and receives messages from the rest of the body. In some ways this is the most important part of the brain because it keeps you alive. Hurting this part of the brain is very serious. The ventricles make the cerebrospinal fluid (CSF) that protect and cushion the brain and spinal cord. CSF also helps to keep the brain healthy and working properly. 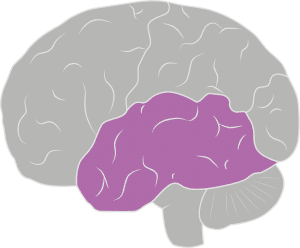 There are lots of interesting things that go on in the very middle of the brain, which is made of smaller parts known as the limbic system. The hypothalamus and pituitary gland control things like your body temperature, how fast you grow and tells you when you are thirsty. The brain is connected to the rest of the body via the spinal cord and the nerves. Together, the brain and spinal cord make up the central nervous system. Messages (nerve impulses) from the brain travel along the spinal cord and control the activities of the body, such as the movement of the arms and legs, sensory functions like touch and temperature, and things we don't think about that go on in the background, like the function of the organs. Nerves branch out from the spinal cord through the dura and vertebrae and become part of the peripheral nervous system. The peripheral nervous system is the network of nerves outside the central nervous system. It carries messages between the central nervous system and the rest of the body. The spine is made up of the backbone and the spinal cord. The backbone is made of vertebrae (spinal bones). Some of the muscles in the back form part of the structure of the spine, to hold it all together. The spinal cord extends from the brain to the lumbar section of the spine. The backbone continues beyond the lumbar section to the coccyx (tail bone). 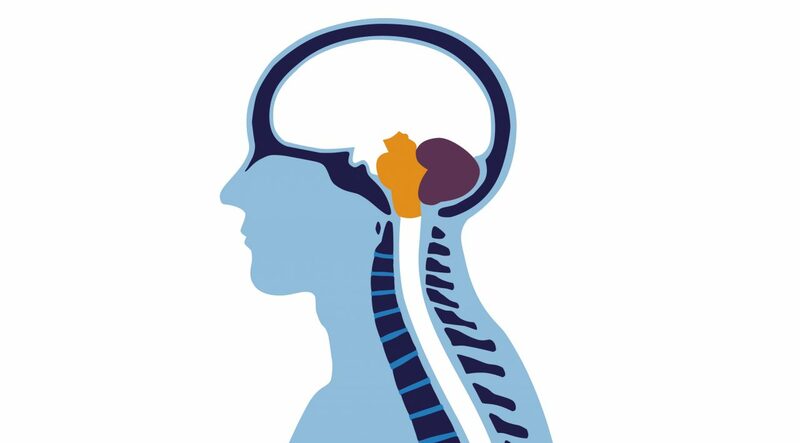 Like the brain, the spinal cord is surrounded and protected by cerebrospinal fluid (CSF). The dura mater (dura) is the tough, fibrous membrane which forms the outer covering of the brain and spinal cord and keeps the CSF in place. 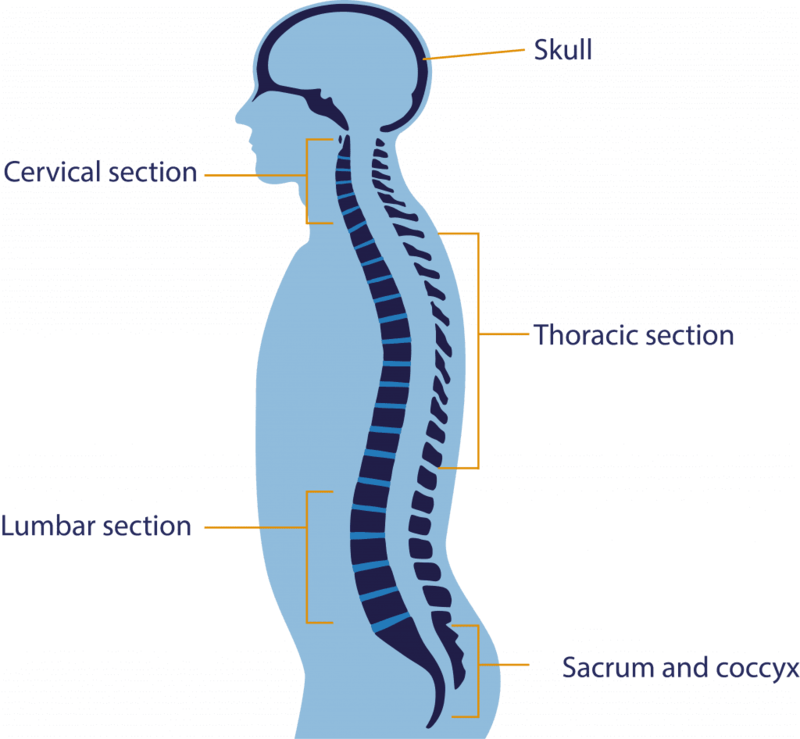 Different sections of the spinal cord are responsible for different movements and functions of the body. At the top of the spine, nerves branching off from the cervical section of the spinal cord supply the arms, hands, neck, shoulders and diaphragm, and enable us to breathe. Nerves branching off from thoracic section of the spinal cord are responsible for the chest muscles and abdominal muscles. The lumbar section of the spine is in the lower part of the back. Nerve impulses to and from this section control hip and leg movements and bladder and bowel function. Finally, at the very bottom of the backbone are the sacrum, a large triangular bone at the base of the spine, and the coccyx, or tailbone. Nerve impulses to and from this section control balance, bladder and bowel function and sexual function.